Feelings: Bahm Mi and various other Asian sandwiches are quite popular below 23rd street, and there are plenty of sandwich shops to choose from. When I read that there is finally an Asian fusion sandwich shop available near my work in Hell's Kitchen, I had to try it tout de suite. Xie Xie is a new project by Jean George's executive sous chef, Angelo Sosa, and it has a posh and modern Hell's Kitchen's vibe. They were blasting Electronica, and the attractive workers with glowing skin seemed to be enjoying themselves working there. One reason why I enjoy Asian sandwiches is their options for seafood and vegetarian sandwiches. 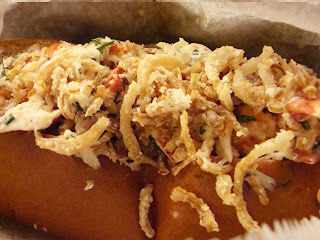 Unfortunately, they did not have the vegetarian option on their menu, but I tried their fish sandwich, "Fish Cha Ca La Vong" ($8.75, tilapia, onion jam, sriracha mayonnaise, dill on mini baguette), and AP ordered their most expensive lobster roll sandwich ($14, Japanese mayo, tarragon, crispy shallots on hotdog buns), both as takeouts. While we were waiting for our sandwiches, Mr. Angelo Sosa himself explained to me about their large drink selection displayed in the back. They had small bottles of wine and sake that were packaged like cute soft drinks. What a fascinating idea! If you brought these back to your office, no one would possibly know that you are drinking, ever. Being quite diligent office workers, AP and I skipped the drinks, of course. I was also curious about their 1000 year old ice cream sandwich, which is supposed to resemble the traditional 1000 year old egg, but with ice cream and caramel inside. Perhaps next time. It was also nice to see Andrew Knowlton from The Food Network and Bon Appetit magazine at the place. AP accidentally almost took his meal, and I wondered if he was either critiquing this place or this is his new lunch spot. My expectation was raising higher as we walked back to the office. I took a bite out of my fish sandwich. The fish was a bit too salty for my taste but had nice flavor together as a sandwich overall. I did not quite enjoy the big chunks of dill laying out between the fish and the baguette. I love dill, but as I took a bite, a long piece of sauce-covered dill came out from the sandwich, which became a messy experience. Many Asian sandwiches are supposed to be messy and sloppy, however. AP said about his lobster roll sandwich, "It was good enough but not good enough to get it again. I should have gotten one of those drinks." I do not think either of us could afford to spend $15 for sandwiches too often. 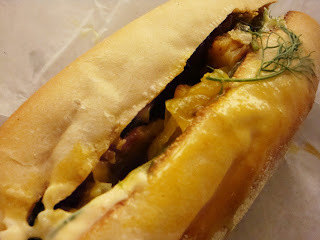 But Sa-Sha mentioned that they received good reviews about their pork sandwich, so if you are not a vegetarian and have extra lunch money, that is what you should try.